In this riveting and adventure-packed follow-up to Peter and the Starcatchers, we discover Peter leaving the relative safety of Mollusk Island—along with his trusted companion Tinker Bell—for the cold, damp streets of London. On a difficult journey across the sea, he and Tink discover the dark and deadly, slithering part-man/part-creature Lord Ombra. It seems that the dreaded Ombra has a variety of mysterious powers including the ability to make shadows disappear. 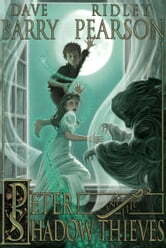 In the second book of the Peter Pan prequel trilogy, Peter heads to London to try to warn Molly that someone is searching for the star stuff. It was a bit long winded at time, but it was still a fun read.